It is the 13th most populous country in the world. Officially known as Socialist Republic of Vietnam, it is a communist country in the easternmost country on the Indochina Peninsula in Southeast Asia. It is a historical country being inhabited since Paleolithic times. There are some archaeological sites in Thanh Hóa Province purportedly date back several thousand years. Vietnam is larger than Italy and almost the size of Germany. If you are spending some Vietnam tours here are some interesting sights to visit in this country; Ha Long Bay (a UNESCO World Heritage Site), Son Doong Cave (the world's largest cave in Phong Nha-Ke Bang National Park), Ho Chi Minh City's Downtown, Saigon River Port, Cao Dai temple in Tay Ninh, Nha Trang´s coastline, Hoi An (a UNESCO World Heritage Site) and so many more. This country is an amalgam of different races. Philippines is known as Asia's sleeping tiger that has yet to achieve its full economic potential. It is the largest Christian nation in the region with over 7,107 islands and beautiful tropical beaches. 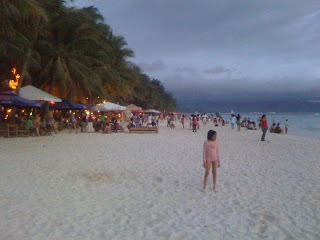 the beautiful Boracay white sand beach in the Philippines, one of the finest beaches in the world. Interesting cities and places to visit include; Manila, Cebu, Davao, Antipolo, Quezon City, Zamboanga, Caloocan, Bohol, Palawan. Don't miss the white long beaches and nightlife in Boracay. A visit to the Barasoain Church in Malolos, Bulacan where the First Philippine Republic was founded is also recommended. Don't forget Makati, the country's financial center. The 2000-year-old rice terraces of Banaue, built onto the mountains of Ifugao in the Philippines by ancestors of the Batad indigenous people is also a must-see. Try wakeboarding at Southeast Asia's largest wakeboarding center in Camarines Sur. Surfing and scuba diving is also a major draw for visitors in the Philippines. Known as he Land of Smiles with frenetic cities and chilled-out beaches, Thailand is the most popular destination in southeast Asia. It is the 50th largest country in the world slightly larger that Spain. The largest city is Bangkok, the capital, which is also the country's center of political, commercial, industrial and cultural activities. Don't miss the nightlife in this city. The limestone cliffs, azure waters and perfect beaches of Krabi in Thailand is worth to see and experience. The Sight not to miss include Phanom Rung (a temple in Thailand from the former Khmer Empire), Grand Palace in Bangkok built in 1782 (the official residence of the King of Thailand), Statue of a mythical Kinnon at Wat Phra Kaew in Bangkok, Ananda Samakhom Throne Hall (the old meeting place of the National Assembly, now only the State Opening is held there) are only some of the sights not to miss in this country. Known as "the Lion City" is a clean and orderly island-city state. The country is highly urbanised with very little primary rainforest remaining, although more land is being created for development through land reclamation. 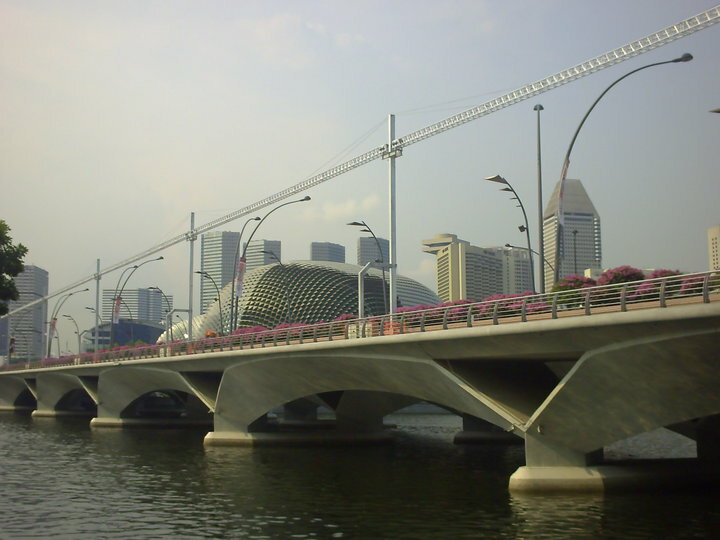 a bridge in Singapore and the durian-shaped Esplanade in front of the Marina Square in the background. 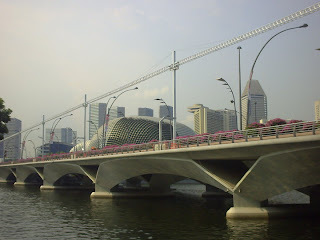 The Port of Singapore, Sentosa Island, Singapore's Parliament House, the durian-shaped Esplanade in front of the Marina Square area are some of the sights not to miss. The Southern island of Pulau Hantu, particularly, is known for its rich coral reefs. Water sports are popular, including sailing, kayaking and water skiing. Scuba diving is another popular recreational sport. The sleeping giant of Southeast Asia and the world's largest archipelago, with more than 18,000 islands spanning three time zones. Indonesia comprises 13,466 islands. It is the world's fourth most populous country with over 238 million people, and has the world's largest population of Muslims. The eerie, continually erupting volcanoes of Mount Bromo in Indonesia is worth to see. A visit in Jakarta, the capital of Indonesia and the country's largest commercial center is a must. The Istiqlal Mosque in Central Jakarta is also worth to see. Other interesting cities to visit include Surabaya, Bandung, Medan and Semarang.